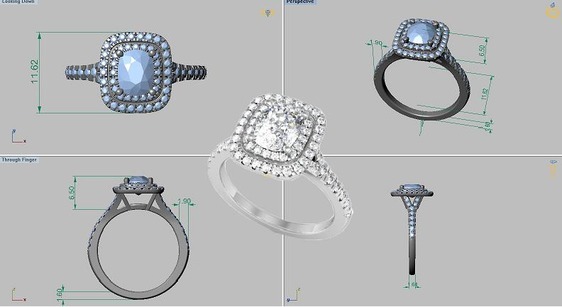 Prospect Jewelers owner, Rob Prince, brings more than 35 years of experience in the creation of custom jewelry designs. Our customers say that Rob has an uncanny ability to "get inside their heads" and help them bring their ideas to life resulting in unique, finely crafted and exquisite custom jewelry. At Prospect Jewelers, we believe jewelry is an expression of your personality and everyone deserves a piece of jewelry that is special and unique. Our in-house jewelry designers and goldsmiths are inspired by this ideology, designing and crafting a piece that is as special and unique as you are. Our artisans enable you to bring your ideas and dreams to life in a piece of jewelry that was designed just for you; a piece that you will treasure and will be proud to pass down to future generations. If you’re looking to design a custom engagement ring, earrings or necklace, or if you want to restyle an out-of-date piece, our jewelers will make the process an enjoyable experience you’ll never forget. You may have seen a picture of a ring you like and want to use gems from a meaningful or valuable piece you already own. Perhaps you have your engagement ring and have not yet been able to find a band that complements instead of taking the attention away from the solitaire ring you love. There may be personal symbolism or colors you would like to be represented in your wedding set or bands. We will listen to you and make it happen for you. We take pride in using high quality materials when it comes to creating your one-of-a-kind ring. We expect the same when working with outside vendors. Whitehouse Brothers, one of our favorite design outlets, maintain the high quality standards that we expect. Their exquisite online catalog of vintage-style rings is a perfect place to start brainstorming design ideas for an elegantly sophisticated engagement ring. Click here to begin your happily ever after. We specialize in bringing the best out of beautiful colors or shapes of gemstones, paying attention to the way the piece will rest on the hand, neck or finger for the utmost comfort. How will the piece compliment the angle of your cheek or the length of your neck or fingers? We will examine durability of design and gemstone safety so the piece will fit your lifestyle and the way you want to wear it. There is no detail left undone. When you put this new piece on, it is you. It feels like it is finally at home. Contact Us to celebrate your uniqueness. This is where you can tell your story and where the fun begins. Our rich heritage is shared and passed down over the years through jewelry. You may want to enlarge the center diamond in a great grandmother’s beautiful art deco solitaire ring from the 1920s. Often the styles are out of date, or the piece is beyond restoration. It is your time to continue the tradition. Together we will discuss the history and meaning represented in these pieces for you. You will not just have a new piece of jewelry, but an heirloom and story you can share and enjoy for years! Click here to refashion your legacy.